1. Cook the pasta in a large pan of salted boiling water according to pack instructions. Meanwhile, heat a frying pan over a medium heat and cook the whole salad onions and chilli until nicely charred (about 3-4 minutes). Remove from the heat, trim and roughly chop, then pulse in a small food processor until finely chopped. Add the yogurt, mayonnaise, oil and lemon juice; season. Blend again until combined, then stir through the dill. 2. Drain the pasta and refresh under cold running water. 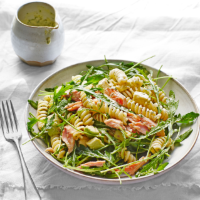 Combine the pasta, trout, avocado and rocket in a large bowl, add some of the dressing and mix until coated. Season and serve with any remaining dressing on the side.